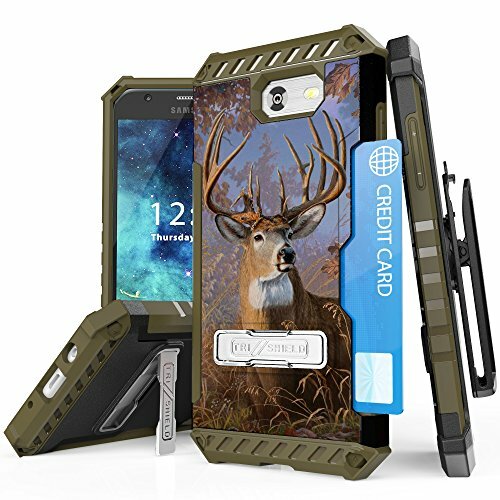 The Tri-Shield Case combines all the key elements that you desire: military grade drop protection, kickstand hands free viewing, enhanced grip and one-of-a-kind sleek design. KICKSTAND: Back of the case features a built-in magnetic kickstand so you can prop your phone in landscape mode on a table/desk. This is ideal for watching movies and YouTube videos - also handy for those who use their phone as an alarm clock! MILITARY GRADE PROTECTION: This rugged case is military tested to withstand those accidental drops. The inner layer is composed of flexible TPU rubber material and the reinforced corners will provide shock absorption. The exterior hard shell provides impact resistance. FUNCTIONALITY: Your phone is fully functional in the case; access to all ports. CARRYING STRAP/LANYARD: This case comes with a detachable lanyard strap - you can attach this strap to any of the four corners. CREDIT CARD STORAGE: Features a rear slot where you can store one credit card, business card, or ID card, etc.. Ditch your wallet, carry less and simplify your life. This is great for everyday use...ideal for those quick trips to the store when you just need to grab your debit card and phone. Please NOTE: NO Phone, NO Screen Protector Included with Purchase! US Seller. If you have any questions about this product by customerfirst, contact us by completing and submitting the form below. If you are looking for a specif part number, please include it with your message.